"I don't have any money…" "Get it from your father-in-law - he has all the money in the world." Sony has dropped one final trailer for Ridley Scott's movie All the Money in the World, which has been making headlines recently with the last minute Christopher Plummer update. The movie hits theaters Christmas Day, so this is truly a last minute trailer in hopes it will drum up buzz and get people into theaters to watch it (I guess the reshoots cost a lot of money). The film is about the true story from the 1970s of a massive kidnapping plot arranged by a left-wing paramilitary organization in Italy. Plummer plays the "richest man in the world" oil tycoon J. Paul Getty. All the Money in the World also co-stars Mark Wahlberg, Michelle Williams, Timothy Hutton, Charlie Plummer, Andrew Buchan, Olivia Grant, Teresa Mahoney, Romain Duris, and Charlie Shotwell. This is an intense trailer, and should make you excited to see this. You can also still watch the first trailer for All the Money in the World here, for more footage (with Spacey). 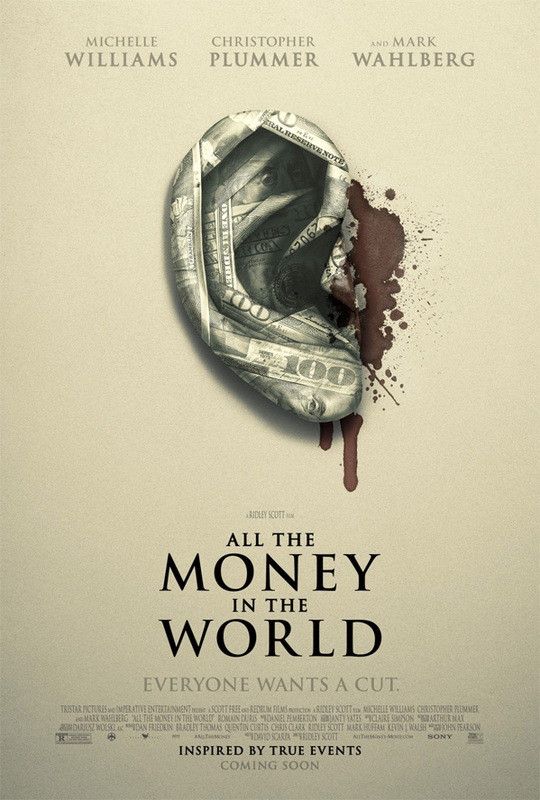 All the Money in the World follows the kidnapping of 16-year-old John Paul Getty III (Charlie Plummer) and the desperate attempt by his devoted mother Gail (Michelle Williams) to convince his billionaire grandfather (Kevin Spacey) to pay the ransom. When Getty Sr. refuses, Gail attempts to sway him as her son’s captors become increasingly volatile and brutal. With her son’s life in the balance, Gail and Getty’s advisor (Mark Wahlberg) become unlikely allies in the race against time that ultimately reveals the true and lasting value of love over money. All the Money in the World is directed by acclaimed filmmaker Ridley Scott, of Alien, Prometheus, Alien; Covenant, The Martian, Gladiator, Robin Hood, American Gangster, The Counselor, Matchstick Men, Blade Runner, Black Hawk Down, Kingdom of Heaven, and Legend previously. The screenplay is written by David Scarpa (The Last Castle, The Day the Earth Stood Still). Sony will release All the Money in the World in theaters starting December 25th next week. You in?